Jeffrey Verdon, 36, was declared a dangerous offender on Friday. 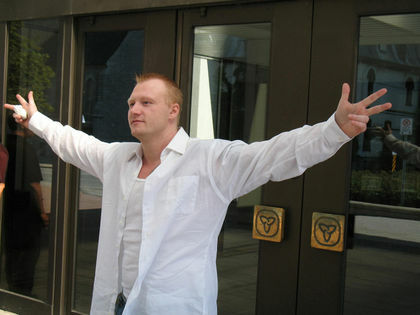 He is pictured here after being acquitted of forcible confinement, assault, sexual assault and uttering a death threat in 2009. Megan Gillis/Ottawa Sun. Violent killer Jeffrey Verdon is a sensitive psychopath who may be treatable, a court heard Monday. Testifying for the defence at the recidivist’s dangerous offender hearing — Verdon faces the possibility of an indefinite prison sentence — psychiatrist Jeff McMaster painted a different picture of a man deemed by another shrink to be a stone-cold psychopath. So-called primary psychopaths tend to be emotionless creatures lacking in conscience almost from birth but secondary psychopaths are more often forged from deep trauma. Verdon — who was abducted and nearly drowned in an incident that killed his brother, whose father committed suicide, and who suffered abuse and abandonment as a youth — is “more consistent with a secondary type,” McMaster said. Secondary psychopaths are generally more responsive to treatment, he added. Another psychiatrist had scored Verdon high on a psychopathy checklist; McMaster scored Verdon much lower — actually below what’s generally considered to be the threshold for psychopathy. Stressing the limitations of such tests, McMaster told defence lawyer Diane Condo why he believed Verdon deserved a lower score. McMaster, for instance, believed Verdon to be remorseful for his most serious offences, including the manslaughter of a newspaper delivery man. “He knows how (his victims) must feel, given all the trauma he’s experienced in his lifetime,” McMaster said. And while McMaster said it “seems hard to believe,” Verdon told him that he was in love with pretty much every girl he dated. One woman even said Verdon was, beneath his thick skin, a sensitive man. If Jeffrey Verdon had been a woman, the Ottawa Police and the Children's Aid Society would have treated him as a victim and claimed that he was provoked and Dr. David MacLean would claimed that his spouse was a danger and that her supervised access should be terminated because she did not support the CAS decision to place the children with the violent offender. That's what you can expect from the corrupt Ottawa police and corrupt Children's Aid Society of Ottawa.